Special thanks to Nestle Balance Your Plate for sponsoring this post. As always, all opinions are my own. 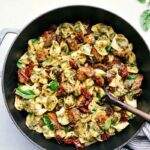 This one pot pesto chicken tortellini is one of my family’s go-to meals. It’s made in one pot, so flavorful, and kid-friendly! My kids beg for me to make this recipe and I never complain because it’s so easy to make and I love all the good ingredients they’re getting – lean protein, a fresh and light pasta sauce, and veggies. Plus, only one pot to wash? Yes please. 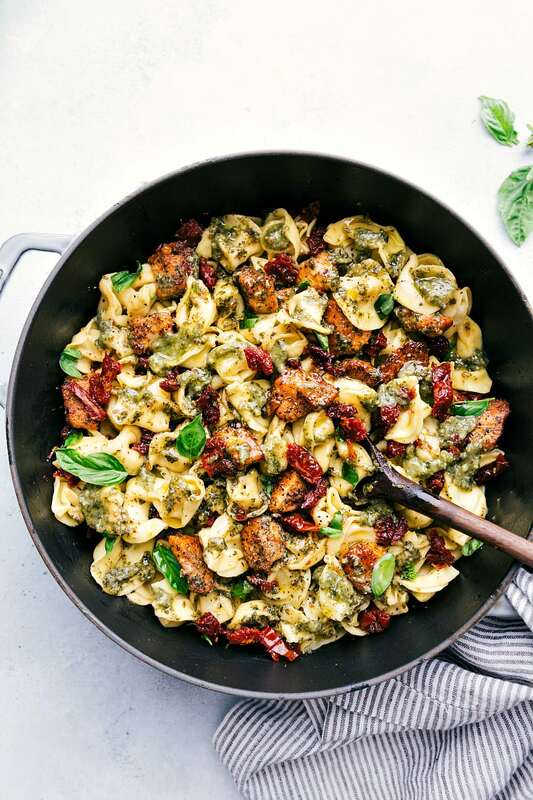 Balance Your Plate with this one pot pesto chicken tortellini! Research shows that Americans are only meeting MyPlate recommendations for vegetables, fruit, proteins, dairy, and grains SEVEN days out of 365. Woah! So that’s where Nestle’s Balance Your Plate program comes into play — it’s an educational program designed to help you put together delicious AND nutritious meals that incorporate both fresh and prepared foods. Prepared foods are a great time saver and there are so many new dishes and flavors to choose from. As you begin to build a balanced meal, use prepared foods as your base and pair with an easy-to-make side dish of fruits, vegetables, whole grains, and/or low fat dairy. 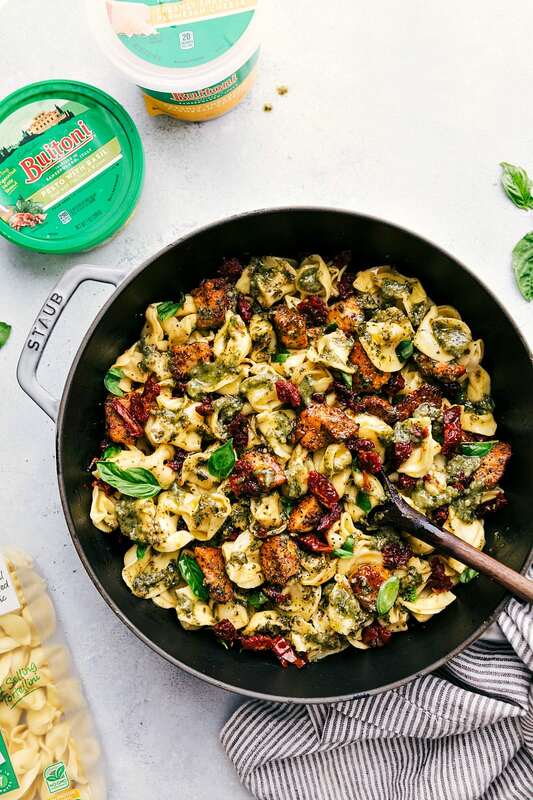 This one pot pesto chicken tortellini is the perfect balanced meal — we’re using prepared Buitoni tortellini as the base and pairing it veggies: sun-dried tomatoes and topping it with an herb-packed pesto. This dish also has lean protein — chicken breast! Visit Balance Your Plate for more information! And for more delicious recipes and inspiration click here. What ingredients are in this one pot pesto chicken tortellini? With less than 10 required ingredients for this dish, we’re packing in some flavorful and good-for-you ingredients. 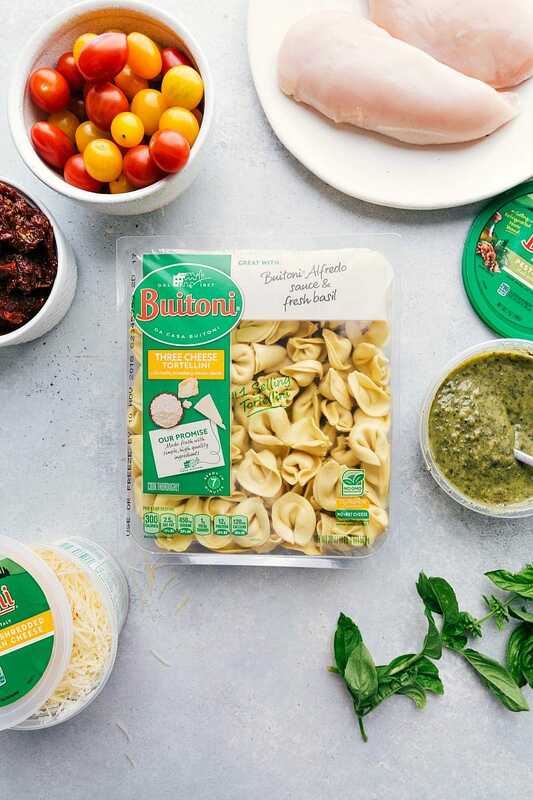 Thanks to Buitoni’s ready-made products such as their refrigerated pasta and refrigerated sauce, it makes it easy to create a fresh dinner and get it on the dinner table fast. We’re using Buitoni’s three cheese tortellini and their pesto basil sauce which forms the base of this meal. We’re also using lean protein — chicken breasts seasoned with paprika, Italian seasoning, and of course some salt + pepper. And for a vegetables addition, we’re adding sun-dried tomatoes! I also occasionally add on some fresh cherry tomatoes to this finished dish to increase vegetable amount. The finished dish gets a few tablespoons of the oil from the sun-dried tomatoes (healthy fats), fresh basil, and if desired some Buitoni parmesan cheese! Bring a large NONSTICK pot of salted water to boil. Follow package directions to cook tortellini. In a small bowl, stir together the paprika, Italian seasoning and salt and pepper to taste (I use 1/2 teaspoon salt + 1/4 teaspoon pepper). Drain the chicken from the buttermilk, dab with paper towel, and toss the chicken pieces to coat in the seasoning mix. Add the flour right on top and stir until chicken pieces are coated. In the same pot used to cook the tortellini (must be a nonstick pot) add in 3 tablespoons reserved olive oil from the sundried tomatoes. Heat on medium heat for about 30 seconds and then add in a sprig of basil and the garlic. Stir for another 30 seconds and then increase the heat to medium and add in the chicken. Cook the chicken, stirring occasionally until cooked through and no longer pink inside. If needed, add additional sundried tomato oil. 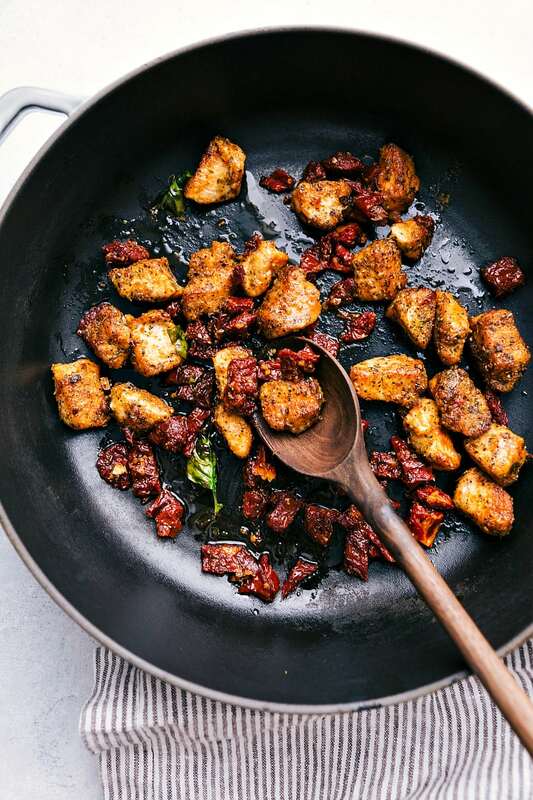 When the chicken is almost cooked through, remove the basil and add in the sundried tomatoes and saute until the chicken is cooked through. Add the drained tortellini back in with the chicken and reduce the heat to low. Gently stir for 1-2 minutes and remove from heat. 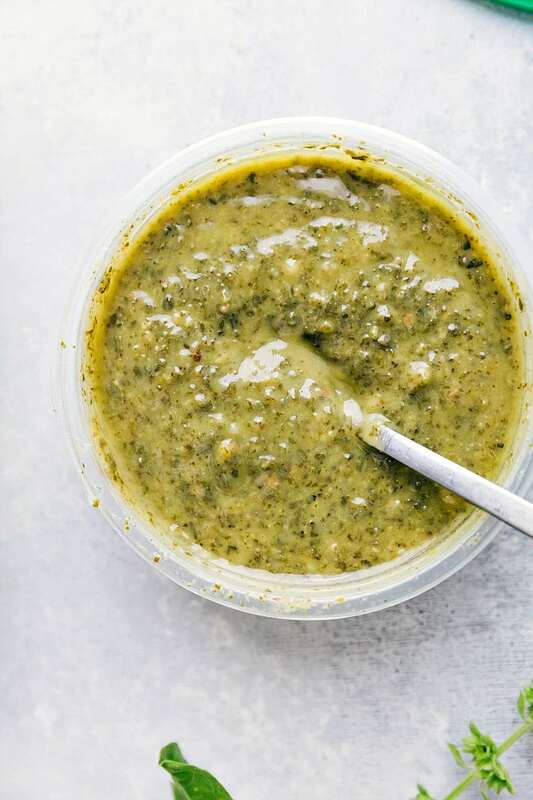 Stir in the basil pesto sauce and 1-2 tablespoons of oil from the sundried tomatoes as desired. Taste and season with salt and pepper and red pepper flakes if desired. Garnish plates with fresh basil add parmesan cheese. *If desired marinate chicken ahead of time. Remove any fat from the chicken breasts and cut into small bite sized and even pieces. Place in a large plastic bag and pour buttermilk over the chicken, knead to coat the chicken entirely. Place in fridge and marinate for 4-6 hours or until ready to use. If you don't have buttermilk, take 1 cup of milk and add 1 tablespoon lemon juice. Allow to sit for 5 minutes and then mix in with your chicken. This creates super tender chicken! What can you serve alongside this one pot pesto chicken tortellini? While this recipe is a great balanced meal, below are our favorite side dishes that pair well with it. A fabulous meal. My daughters always ate pesto as well! I found my 3 year old eating it out of the jar once! Absolutely incredible meal! This will be in high rotation…my 13month old twins wanted this instead of their supper ?? ?